Looking at some pictures of the local area the other day I came across a shot of Hull Pot. 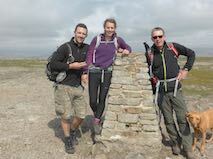 I have seen it on the map as we have walked Penyghent but it is not a spot we have visited. 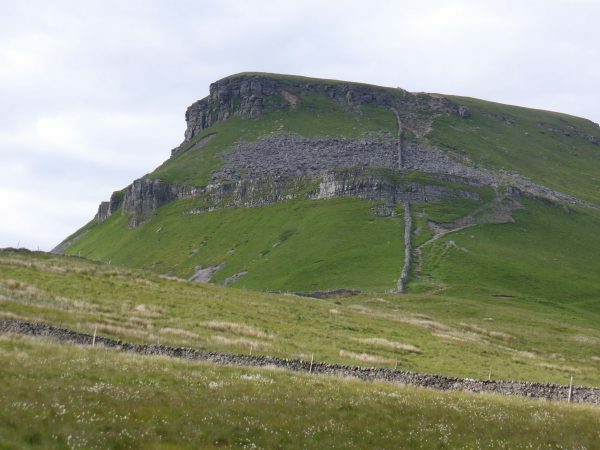 After looking at the map I work out a walk that takes us by Hull Pot but not all the way to the top of Penyghent. We park up in the now familiar Horton in Ribblesdale. Crosby looks at me suspiciously, the last time he was here was at the start of our Three Peaks walk. However his initial concern is soon dismissed as we turn up the lane that takes us alongside Horton Scar. On reaching the gate at the top at a crossroads of paths we go straight on. 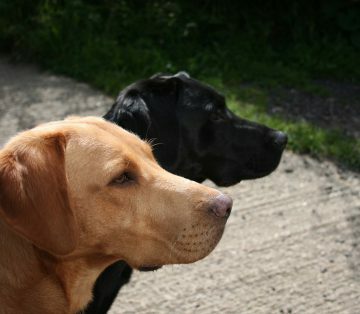 It is a cracking day for walking, the sun is warm but there is a pleasant breeze so it is not too hot. The path is easy going and we can see for miles in all directions. Ahead of us we see a stream and then suddenly, out of nowhere, Hull Pot appears. It is huge, and appears even more so because you arrive at it without any warning. I have read that Hull Pot is the largest natural hole in the country, I expect this is said of other spots, but regardless of whether it is the largest or not it is impressive. I have also read that it was originally a cave and the roof collapsed. It is reported to be 91 metres long, 30 metres wide and 18 metres deep. Above it is the dry riverbed of Hull Pot Beck, after heavy rain this creates an impressive waterfall into the Pot, but not today. Our walk takes us alongside Hull Pot Beck. This has a slightly odd feel, one minute the riverbed is dry and the next there is a steady stream flowing which suddenly disappears underground with no apparent holes. Further up we see water bubbling up through the rocks before another stretch of dry riverbed. We go over a ladder stile on our right and walk uphill to join the bridleway / footpath that leads to Foxup. We follow the well-marked path initially over Horton Moor and then through a series of fields. There are no stiles, just gates in the dry stonewalls so it is easy going. As we walk we survey the horizon. All that can be seen is the natural beauty of the countryside. The only man made objects we can see are the dry stonewalls and gates. Eventually the tops of buildings at Foxup come into view. As they do we arrive at our first field of bears. Young heifers that are extremely curious. They come to the gate to greet us. I enter the field and encourage them away, as Lyn and the boys come into the field they creep up on us. It takes a while for us to safely negotiate this hazard. Eventually we arrive in Foxup. 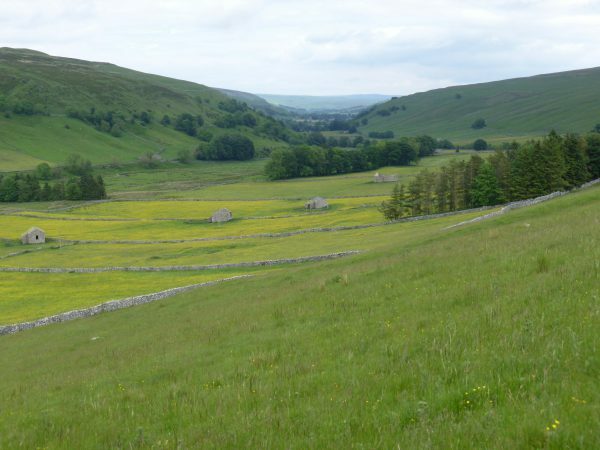 Foxup is a small hamlet at the top of Littondale, lovely on a warm summer afternoon but isolated in the depths of winter. 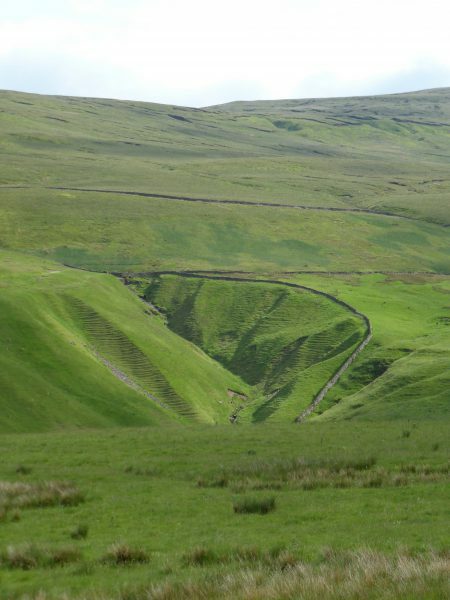 David Johnson’s book on the limestone industry in the Dales talks about the fields around Foxup and through Littondale where lime was spread to improve the soil for agriculture. The meadows have clearly benefitted. 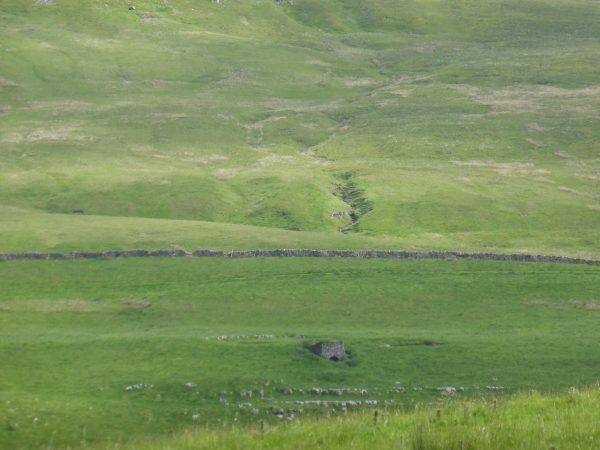 We have a choice of routes, through pastures containing bears or follow the narrow lane around to Foxup Bridge. There is no need for the Electoral Commission to oversee the vote. In total there are five votes passed, Lynnie raises both hands and claims they count as two votes, all voted to walk along the lane. After crossing we continue up hill on the road. It seems odd to describe it as a road. It is tarmac and carries cars between Foxup and Stainforth but very few cars use it so it is like walking along a track. As we get to the top of the hill we start to see Penyghent Gill on our left. This is a stunning valley. Clearly visible above the gill is an old limekiln. Soon Penyghent dominates the view to our left, on we walk past farms and the odd cottage. The folk that live up here must be cut off from the rest of the world for periods during the winter. There are Curlews and Lapwings close to the road. All busy with distraction tactics to ensure that we keep away from their young. Finally after more than three miles on the road we take the footpath on our right to join the Pennine Way. 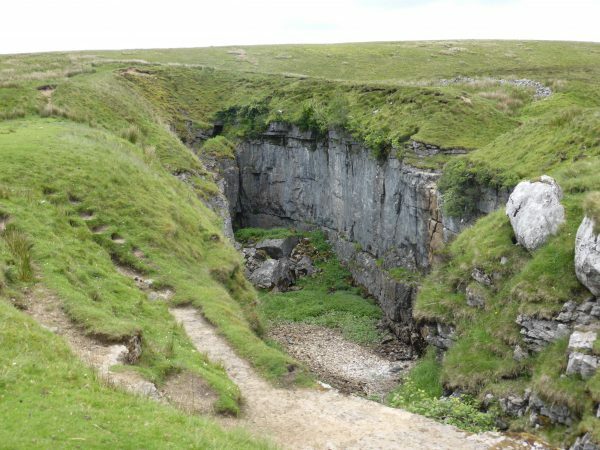 At the impressive Churn Milk Hole we ignore the other paths and continue on the Pennine Way to lead us up towards Penyghent. Directly in front of us is the route we took to Penyghent last week, from here it looks near on impossible to walk up, very steep and scary. For a brief moment we contemplate going all the way to the top again. But the vote this time is ten against and one abstention. Ten because Dexter and Crosby have followed Lyn’s example and have all four paws in the air. I’m the abstention, as undecided, keen to go all the way but aware that if we get to the top we have to come the long way down, adding at least an hour to our already long walk. We turn left and follow the footpath down across Brackenbottom Scar and eventually into Horton. It has been along walk, just short of sixteen miles. We do enjoy being in the Dales.